For most of my life I’ve focused primarily on cardio. I would spend hours hitting the treadmill, running outside 4-6x a week, on the elliptical or riding my bike. I never lost any weight, but I thought calories burned through cardio meant weight loss. It took one conversation with Kendall to realize that I was completely wrong. I committed to changing my body, to changing my lifestyle, and to changing the things I had grown so fond of and feeling comfortable in. I always thought lifting weights meant “bulking up”. I’ve been an athlete in one sense or another my whole life, and bulky is how I described my body. Kendall helped me realize that picking up weights is what my body NEEDED in order to achieve my goals. Lifting weights will has caused a flurry of positive changes in my body. My muscles have responded by growing which also lead to an increased metabolism, my bones have become denser, my hormonal regulation has improved, and just the real life benefits of being stronger overall has helped me in my school board career. The right nutrition, paired with patience and planning were also vital to attaining my goals. It was never a diet! It became a lifestyle change & a commitment to my overall health and positive outlook. Simply tweaking my meals to have less fruit and to maintain a daily balance of meals made the biggest difference. I travelled everywhere with meals. I took the time to meal prep so I felt entitled to enjoy the meals I worked so hard to prepare. Most Sunday’s I dedicated a good couple hours to food shopping and preparing. When my fridge was stocked it left no room for error; no room for excuses. Patience was also key. Progress takes time, and getting discouraged happened, but the commitment I made in the beginning kept me going and kept me pushing harder. My overall level of satisfaction and achievement has completely surpassed anything I thought I was ever capable of achieving. With Kendall’s guidance, encouragement and support I’m a much happier, healthier, stronger, confident, and wiser woman! Thank you Kendall & DollFitness for giving women the change they desire xo! Before Kendall and Doll Fitness, my relationship with the gym was strained to say the least. I was overall very confused, frustrated, and most importantly, dissatisfied with my body. Having relied solely on cardio and HIIT training with minimal weights to get to my goals, I had very quickly plateaued. I was under eating out of fear of gaining weight and then crashing, only to find myself in front of the fridge at 2 am. Very discouraging. After my first meeting with Kendall, her incredibly friendly and knowledgable disposition instilled in me confidence that I had never felt before when it came to fitness and reaching my goals. This only increased as we began to work together. My meal plan was made specifically for me, using the foods I told her I ate the most regularly. I was full, satisfied, and no longer a fridge guest in the middle of the night. My training with her opened my eyes to a whole new (and more effective, enjoyable, fun, etc.) way of working out. For the first time in a long time, my body began to change. Words cannot express how happy I am to finally see my hard work paying off, and it’s all because of Kendall. As I expressed to a friend of mine recently, this is the first time in my life that I feel certain that my fitness goals are going to be met. I am no longer worried about reaching those goals because I know they will come. Thank you Kendall, for showing me what my body is capable of, and instilling in me the confidence to have control over how I look and feel. Kendall’s training techniques have given me quicker results then I expected. More importantly, she’s really helped me understand how skipping meals and fad diets do not sustain the body’s overall well-being or give results. I really enjoy working with her. I have a newfound love for personal training. I have been going to Doll Fitness for just over 2 months now and it has already made a huge impact on my health, energy, and overall well- being. After years of constant yo-yo dieting and binge eating, Kendall has been able to put me on a plan that is finally working! I owe her so much already and can’t wait to continue working with her. In just 2 months I have lost over 20 pounds and ALOT of inchs. Kendall’s plan is helping me get my strength and confidence back like never before! She is incredibly passionate about what she does and extremely knowledgeable. She really inspires you from a holistic approach to take charge of your life again. Thank you so much Kendall for your encouragement, support, and for being on this journey with me. Doll Fitness has changed my life completely, in so many different ways. Before meeting Kendall, my idea of fitness and a healthy lifestyle was based on the information I would learn from social media, magazines, books etc. I have always been an active person, so I believed what I was doing was somewhat correct! Yet, I would never see the results I was constantly working towards.Kendall has an insane amount of knowledge behind fitness and health. She took my goals and aspirations and created a custom meal and fitness plan, that I will follow for the rest of my life. Kendall has opened up my eyes to a complete new way of living, and I couldn’t be any happier. She is constantly available to ask any questions I may have, and is always communicating on things to possibly change, or any progress made each week. The training sessions are challenging, educational, and fun. The gym is beautiful and equipped with amazing machines, weights, etc. Kendall has given me motivation and determination to continue to succeed, no matter what life throws in front of you. I am forever grateful to have started at Doll Fitness and met Kendall! I don’t know what I would do without her!! 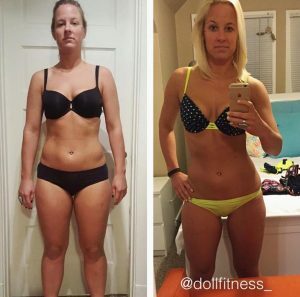 I will continue to recommend Doll Fitness to everyone! Before I met Kendall I thought running miles was the best way to lose weight & I was pretty off the mark with what I THOUGHT were healthy food choices. I wasn’t getting close to the results I wanted and I needed help & motivation to change my lifestyle. Doll Fitness ABSOLUTELY exceeded any expectations I had. Kendall is very knowledgeable, professional & passionate about her career. She tailors your training and meal plans to your individual needs. I surpassed my goals that I had set for myself. My custom meal plans were very simple to incorporate into my busy work schedule and she incorporated all of my favourite foods which made it enjoyable. If something wasn’t working for me in the meal plan Kendall would make adjustments that would curb my cravings & she was always sure I was loving the food. I am never hungry! I will easily follow her meal plan for the rest of my life, it’s flexible, realistic, yummy and it works! She was always available to answer any questions I had along the way. She gave me confidence to exercise properly and effectively. I am so happy with my results and my new lifestyle. I am happier and more energetic and I now have the tools to continue on my own with ease. Her training sessions are challenging, effective & she makes them fun! All you have to do is listen and follow Kendall’s advice and you can do whatever you want! My results speak for themselves. I went from 131 lbs to 118lbs and I lost 25.5 inches and lost 11% of my body fat. My only regret is that I didn’t go see her sooner! I will forever recommend Doll Fitness!! Kendall/ Doll Fitness changed my life! Initially met with Kendall for a meal plan. I had been tirelessly exercising and dieting for years with no results, my exercise included a lot of boot camp style classes and my dieting included a lot of cutting calories. I loved the meal plan so much and after a few short weeks already started to feel better, it was a no brainer to start personal training sessions with Kendall. I did 43 personal training sessions and gained a lifetime of knowledge. Kendall pushed me, taught me, encouraged me and supported me. After years of paying for a gym membership I never used, I am finally using it to its fullest potential. I have gained SO MUCH confidence in myself. I am now able to go to the gym on my own, head straight to the weight training area with confidence and not be intimated by the men or the weights. Not only am I stronger physically I am much stronger mentally and emotionally. Kendall also provides me with updated tailored meal plans to go along with my strength training and I progress. I cannot thank Doll Fitness enough for the education and strength I’ve gained. I have lost over 30 inches and 20 pounds. Everyday I am closer and closer to reaching my goal – thanks to Doll Fitness. Kendall is so knowledge about women’s fitness and the fitness industry.